Growing up with peach trees in my backyard, I have always thought of stone fruits as the quintessential summer produce. As summer slowly comes to an end, I’m taking full advantage of the season’s produce while I still can, and adding them to a variety of dishes. 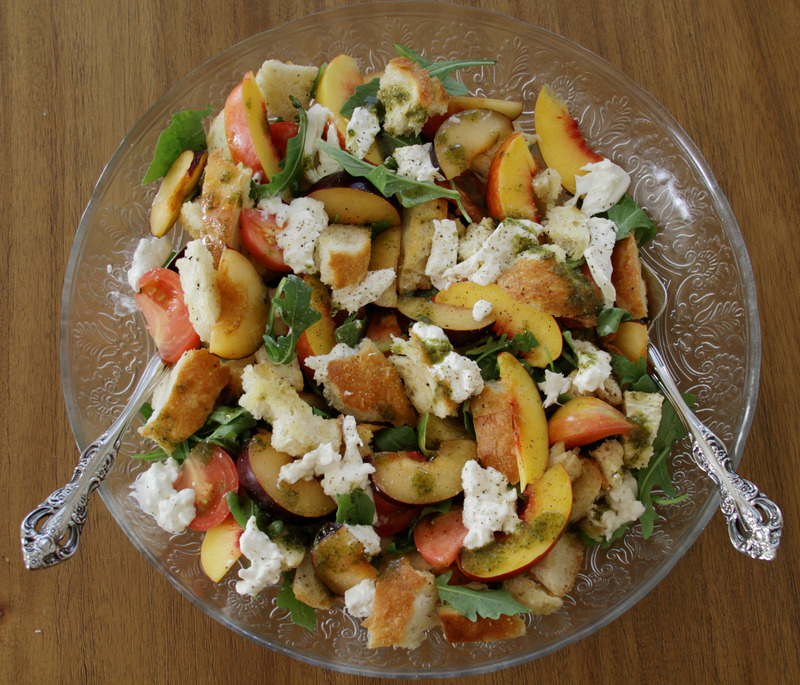 For days when you want something light and summery, but still a bit hearty and filling, this stone fruit panzanella fits all of the above. 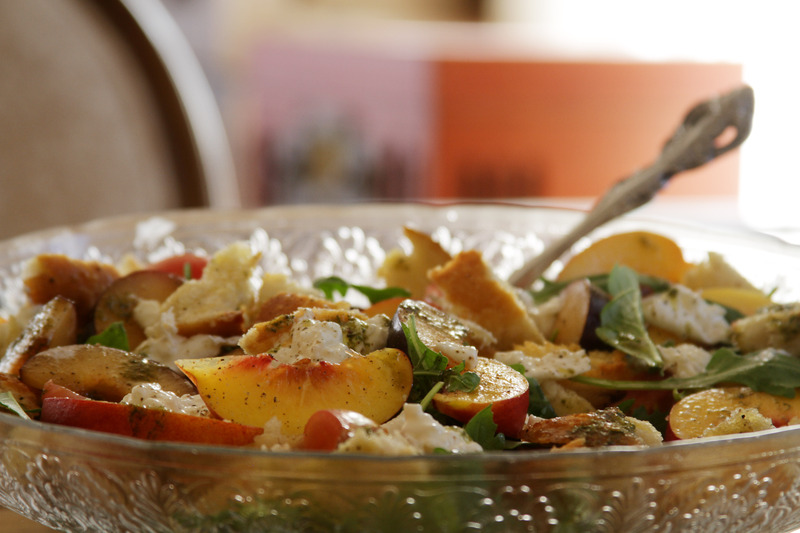 Ingredients: 1 small loaf of bread, 3 nectarines, 3 plums, 2 large heirloom tomatoes, 1/2 cup burrata, 3 cups arugula, 1 tbsp olive oil, 1 tsp salt, 1 tsp pepper. Instructions: Pre-heat oven to 350F. Cut the loaf of bread into slices, then rip apart using your hands to make small pieces. Toss the bread with olive oil, salt, and pepper in a bowl, then place on a baking sheet. Bake in oven for about 8 minutes. You want the bread to be a little toasted, but not so much that they turn into crunchy croutons. 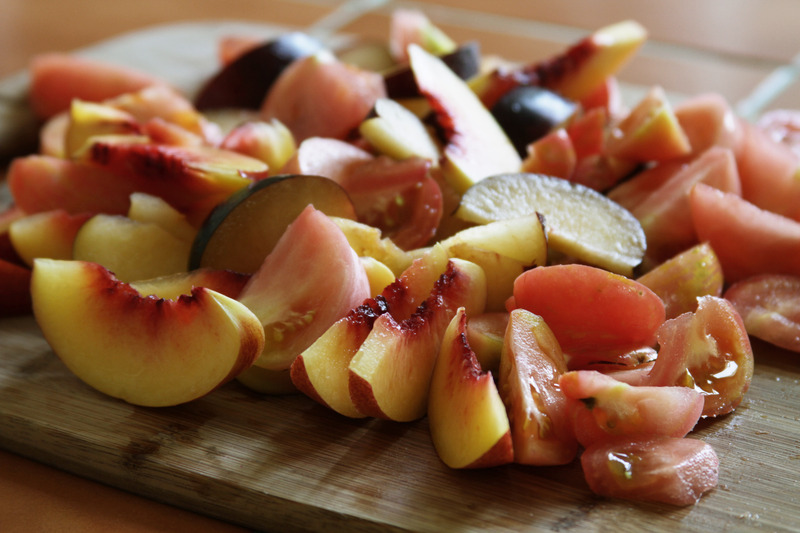 Slice nectarines, plums, and tomatoes into wedges and add to a large bowl. Add arugula, bread, and burrata in small dollops. For the dressing: 1 shallot, 1 cup packed basil, 1 garlic clove, 1/3 cup olive oil, 1/4 cup balsamic vinegar, 1 tsp red pepper flakes, 1 tsp salt, 1 tsp pepper. 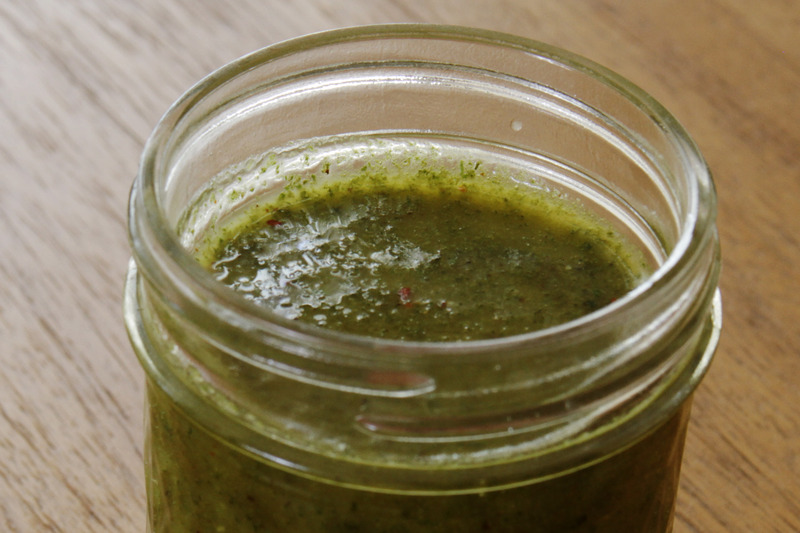 Add all dressing ingredients to a blender, and blend on high until all ingredients are completely liquified. Drizzle dressing and fresh ground pepper over salad before serving. After many months of working on different parts of our home, we have finally finished our dining room. It was difficult to figure out what to do with the flow of this space at first, because it is not a room in and of itself. 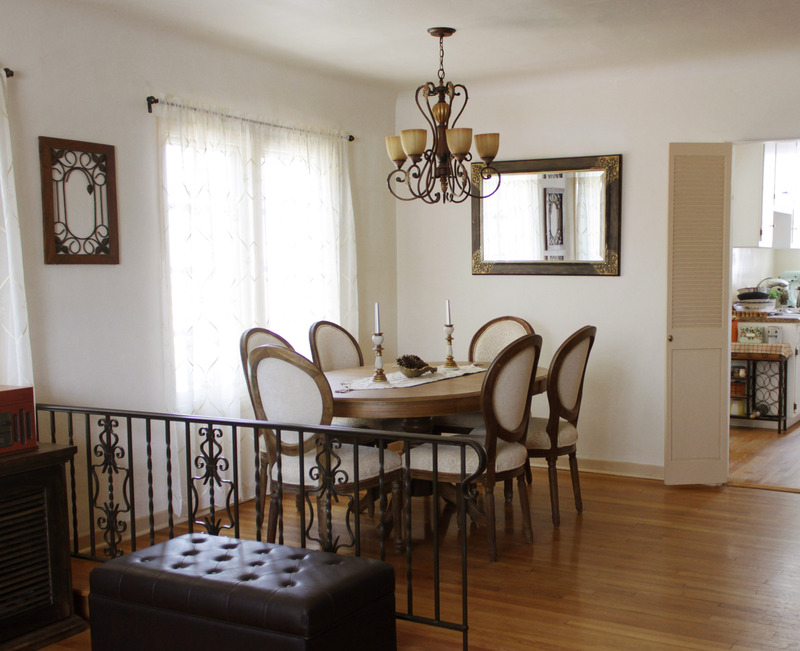 The living room steps up into this dining room, and the kitchen is visible from both. Our goal with the design of the dinning room was to form a transition from the richer dark woods of the living room, to the lighter rougher textures that will one day be in our kitchen. Though this is a fairly small room, it included many individual projects such as the staining and upholstering of our chairs. 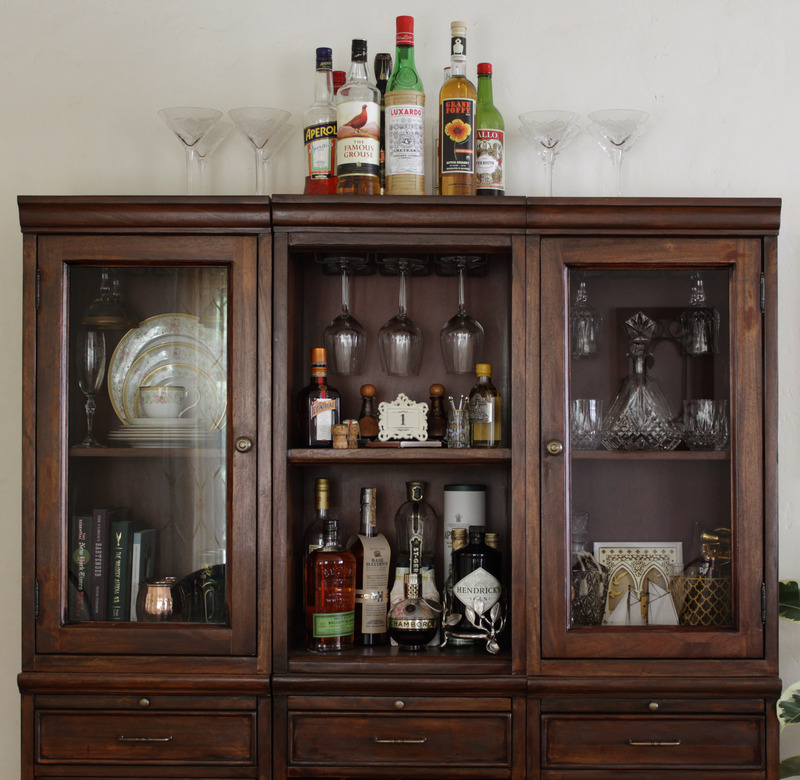 We had intended on simply purchasing a bar cabinet online, but when it arrived, the wood turned out to be significantly redder than we anticipated. Like with our chairs, I decided to re-stain it, and changed out all of the handles from black to a subtle gold. The cabinet didn’t quite fill out the wall, so a small plant and colorful framed art were perfect for filling up the empty space. With the cabinet we now have a chance to display some of the items that we’ve had hidden away for ages, such as our wedding china. 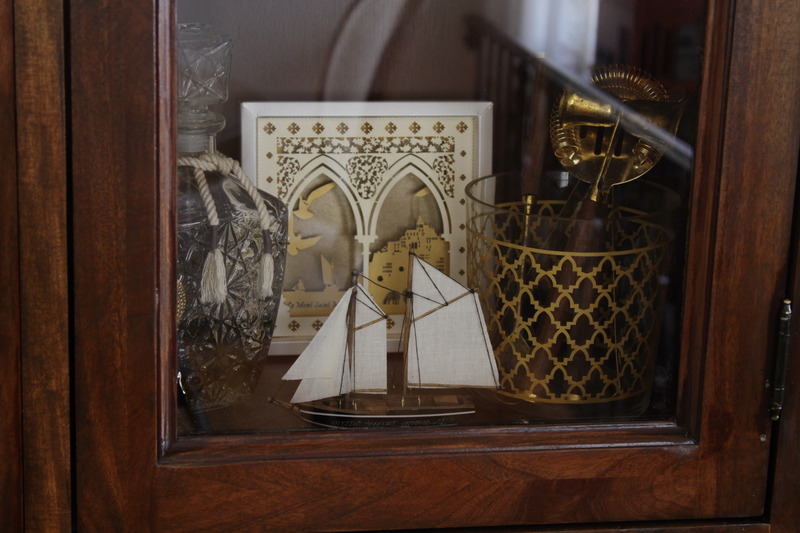 We have also displayed other pieces that have some significance, such as the crystal glasses James used to propose, the framed number from our wedding table, as well as souvenirs from trips such as our honeymoon. 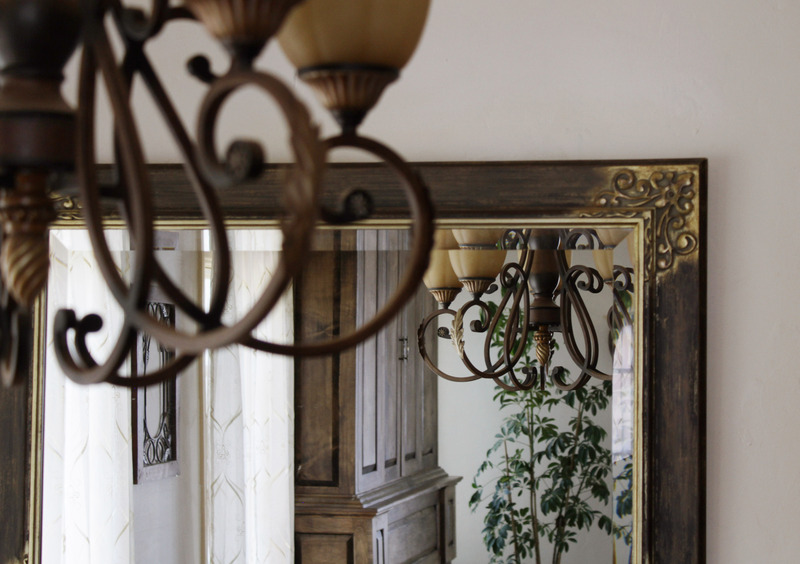 We were able to find this mirror with corners that echo the scrolls of the chandelier and the round backed chairs. In this piece we needed to use paint to bring the blacks and golds more in line with the browns of the room. 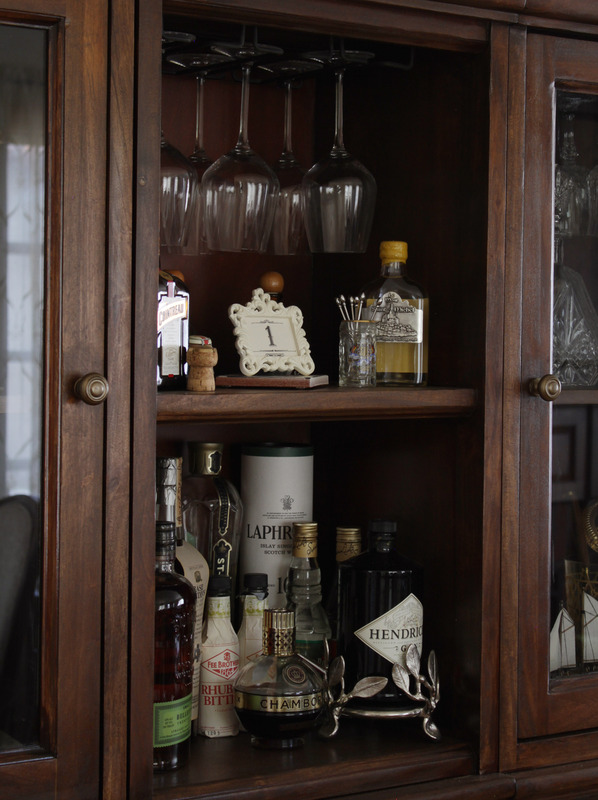 We contemplated a frame at first, but decided on a mirror since it would reflect parts of our living room. Our biggest infrastructure project so far has been the installation of central air conditioning. 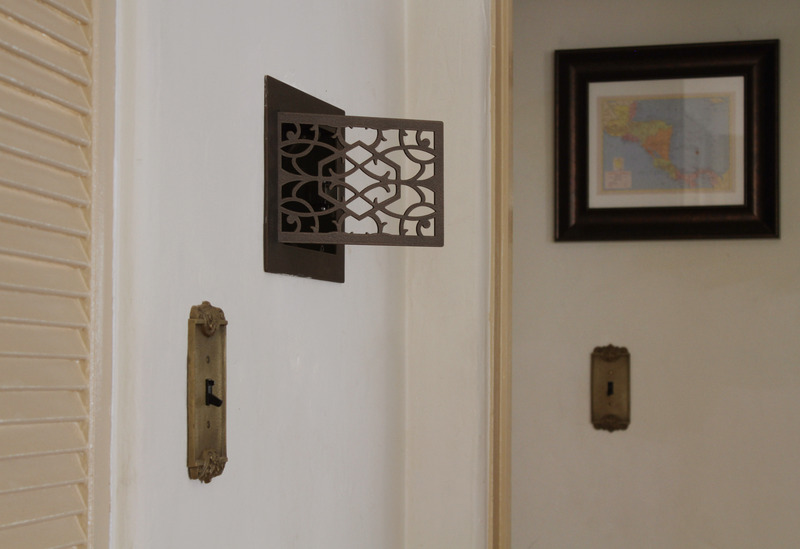 We decided to house the thermostat inside of this decorative metal box cut into the wall, and picked out similar decorative vents for the ceiling as well. 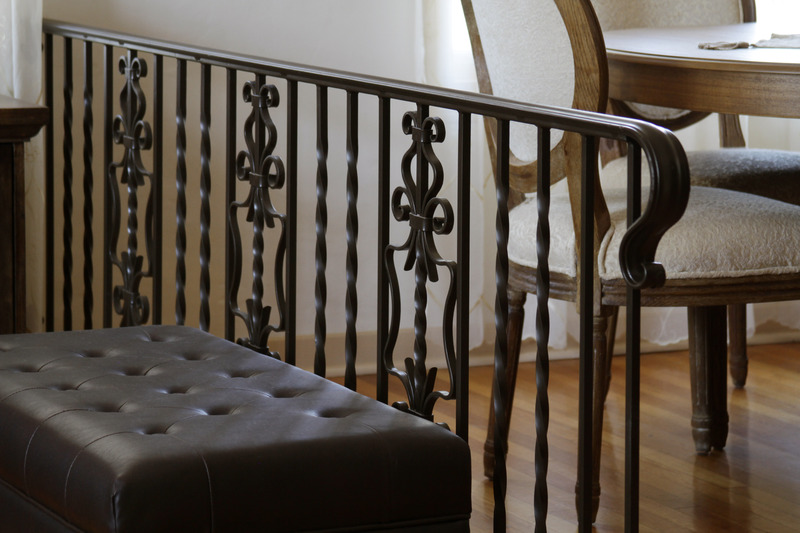 In order to create a separation between the dinning room and living room, we added a small railing which was a custom design built by Isaac’s Ironworks. We gave him reference material based off of the staircase in our old apartment building, and he made it exactly as we envisioned. 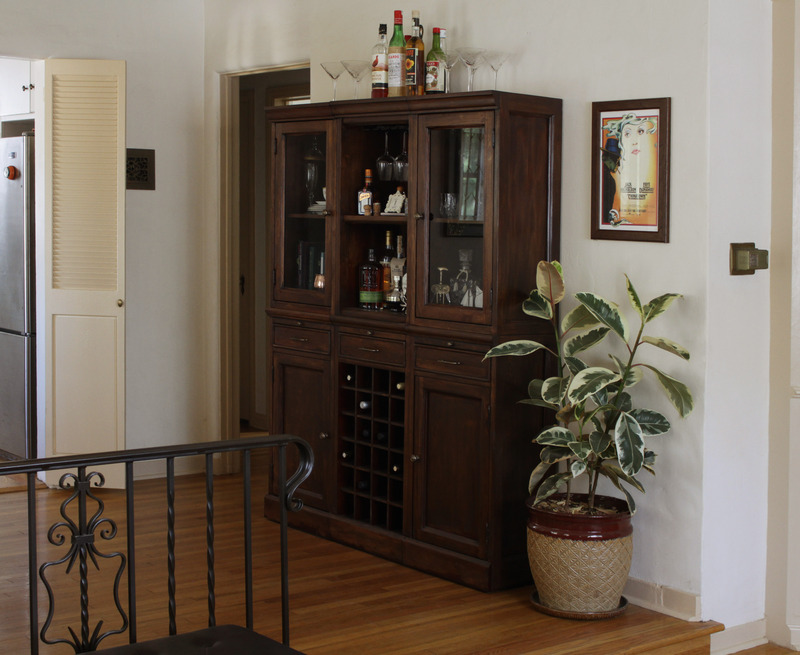 When designing for our house, we’re always keeping in mind what we loved about our apartment, and the iron, the color of the hardwood, and the paint of the doors all create a sense of continuity with those memories. We are relieved to have another room finished in our home, and look forward to entertaining friends and family in this space. Summer at the farmers market means an abundance of produce options. We’ve started to go somewhat regularly to stock up on produce for the week, enjoy a meal from one of the hot food stands, and browse around to discover unique items. 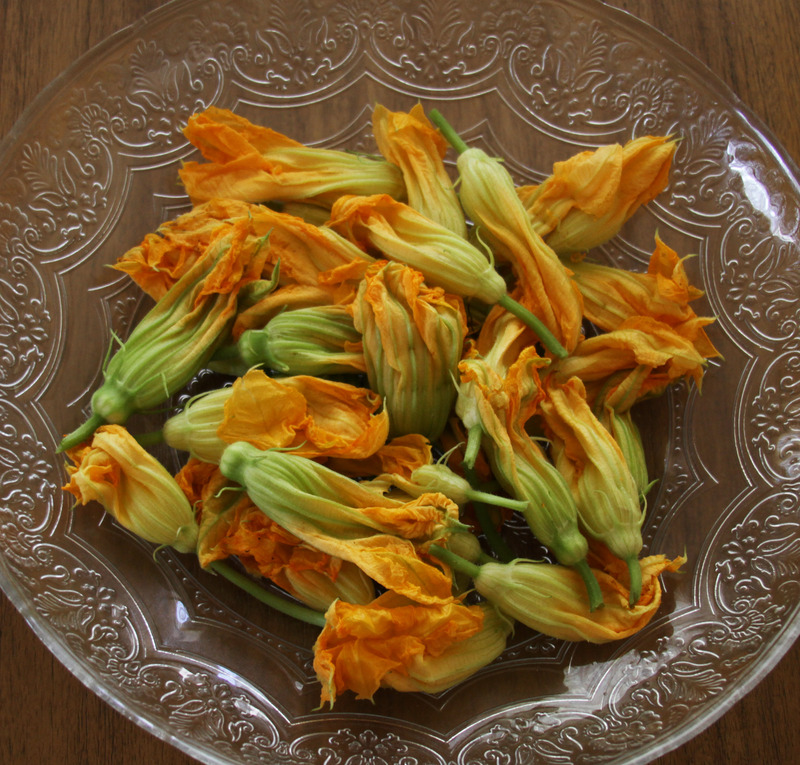 On our most recent trip, I purchased a box of squash blossoms. 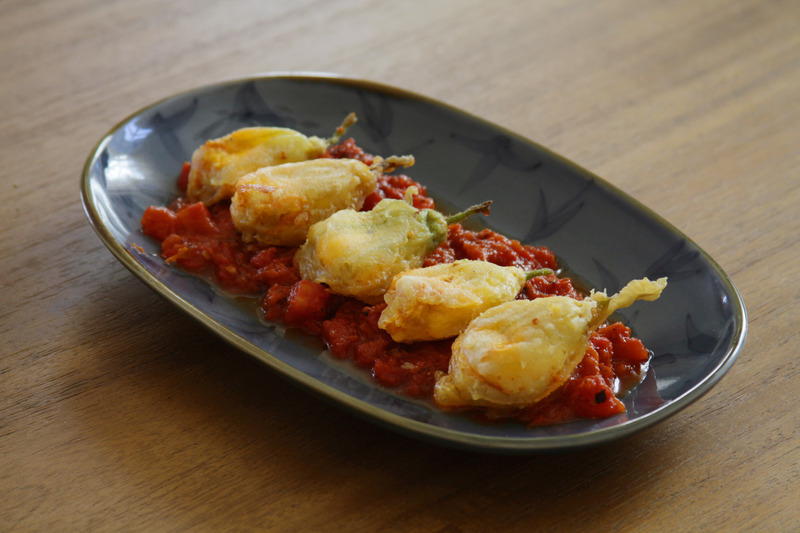 I couldn’t wait to fill them with a creamy cheese mixture, serve with a flavorful tomato sauce, and share them with friends. Instructions: bring a large pot of water to a boil and add all blossoms at once. Boil for about 30 seconds, then immediately remove the blossoms and add them to a bowl of ice water. After blossoms have sat in ice water for about a minute, dump them into a colander, then place them on paper towels to drain. 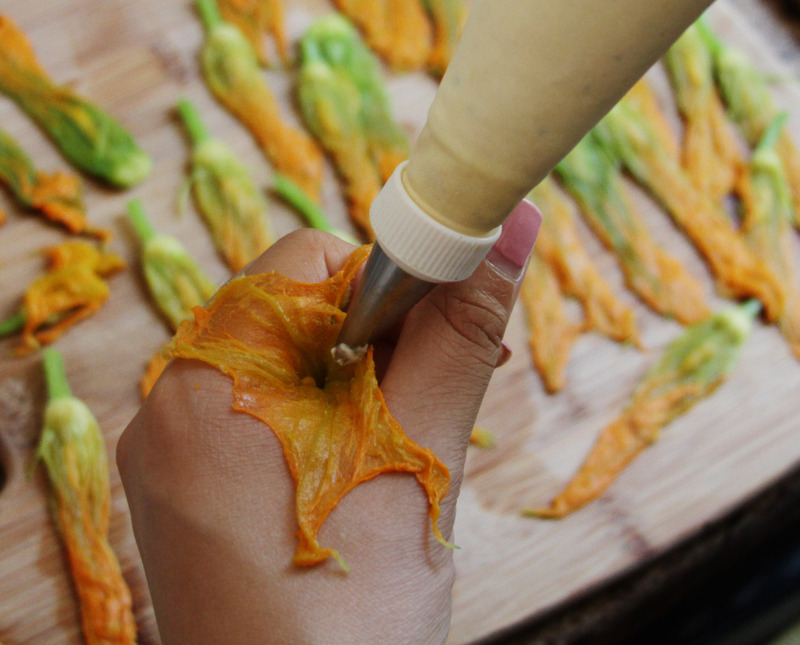 While blossoms are drying a bit, prepare the filling. Combine cheeses, egg, cayenne, and pepper in a bowl and mix until smooth, then scoop filling into a piping bag. To fill each blossom, gently open them to have access to the center. Place piping bag tip toward bottom and fill until filling reaches the opening of the petals. Cover the exposed filling by folding the petals over the top of blossom. Place all blossoms on a plate, and refrigerate for at least 30 minutes so that the cheese will set. To make the batter, combine 1/2 cup flour, 1/4 teaspoon baking powder, and a dash of salt in a bowl. Slowly add cold water to bowl while whisking with a fork until batter is thick but still creamy. Add 1/2 inch of oil to a heavy skillet and heat to 375F. Take blossoms out of refrigerator, and lightly dust with flour. Dip blossoms one by one into batter and place in hot oil. Cook for about 2 minutes, then flip and cook the other side. You’ll see the batter crisping and setting on the bottom as your cue to flip. Set each blossom on a plate with paper towels as they cook. Ingredients (for sauce): 1 can fire roasted diced tomatoes, 2 Tbsp olive oil, 1 large sliced garlic clove, 1 tsp paprika, 1 tsp salt, 1 tsp pepper. To make the sauce, add tomatoes, olive oil, garlic, paprika, salt, and pepper to a small saucepan and bring to a simmer. Let tomatoes simmer for about 10 minutes, stirring occasionally. 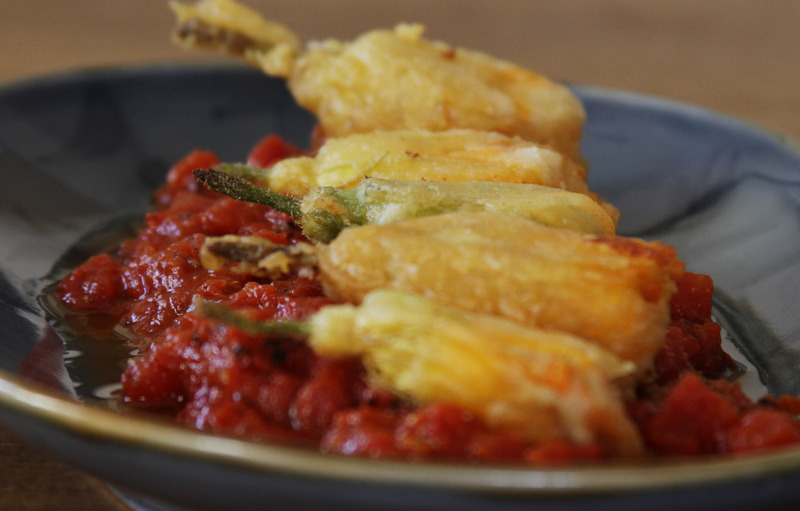 Serve blossoms over warm tomato sauce as an appetizer or as a snack.